Last time I posted was shortly before I went on Christmas vacation, and it had been raining alot. Strangely, it has been raining alot, again. Here's a picture of Chicago in the winter at night. 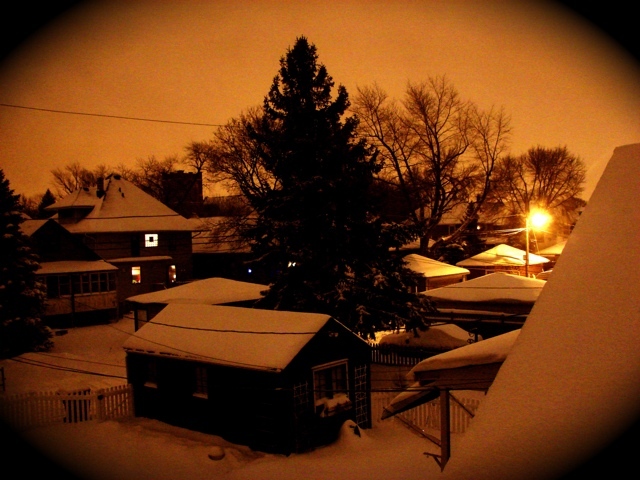 The snow on the ground and the permanent overcast clouds trap the light the streetlamps, so the entire city is constantly illuminated with a warm orange glow. I also took a few days and went back to visit my friends from college in Ann Arbor, which was fun. I hadn't seen any of them since I graduated in April '06. But the Amtrak train provides a very handy service, four and a half hours to go the 250 miles between Chicago and Ann Arbor; and you can buy tickets as little as 10 minutes before the train leaves. Since I got back to California I have begun taking flying lessons! It's fairly expensive, so I can't fly too much, which means it will take a few months to get my pilot's license, but it's been fun so far! 55 visitors came while this was the current page.